Bright White Smile, More Confident You! There are many products and techniques available for patients who want to achieve a brighter smile, and with so many options available, it can be difficult to choose the method that is right for you. The best way to begin any teeth whitening regimen is to schedule an appointment and talk to your doctor about the differences between in office professional whitening and at home whitening. Call us today and be on your way to a beautiful, confident smile! procedure is performed in our dental office. 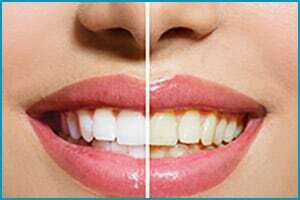 An in office whitening treatment may include the use of a whitening lamp or laser to enhance the effectiveness of the whitening gel by accelerating the peroxide. Call us today about your new bright white smile – or you may contact us using this handy form – we’ll get back to you right away!